"As the public debate has become increasingly partisan and polarized, it is more important than ever for citizens to have full access to the same neutral, unbiased information that many of us rely on to help us formulate important decisions," they wrote. Congress established the Congressional Research Service in 1914 to provide policy and legal analysis to members of Congress. Although its reports are not classified, CRS has never made them openly accessible at a public level. "Taxpayers spend more than $100 million per year supporting the work of CRS, and they should have access to the reports CRS produces," Lance and Quigley wrote. 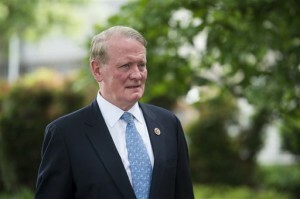 Directs the Clerk of the House of Representatives, in consultation with the Director of the Congressional Research Service (CRS), to establish and maintain a centralized, searchable, bulk downloadable, electronic database consisting of: (1) CRS Issue Briefs, Reports, Authorization of Appropriations Products and Appropriations Products, and other materials intended or available for general congressional distribution through the CRS website; and (2) an index of such information. The congressmen’s letter comes one day after the New York Times called for CRS transparency, referring to Lance’s January legislation. "Every day, the Congressional Research Service, a little-known government agency attached to the Library of Congress, churns out papers on issues as varied as the defense budget, the farm bill and nuclear weapons," the Times wrote. "Given the extreme partisanship and gridlock in Congress, it’s more crucial than ever to have an informed electorate. Putting these reports in the public domain is an important step toward that goal." A former CRS employee criticized the taxpayer funded think-tank’s current state, the same month Lance and Quigley introduced their legislation. According to former analyst Kevin Kosar, CRS researchers now spend more time responding to constituents’ and congressional staffers’ queries than generating policy papers. "Much of my workday was now taken up by requests that had little if anything to do with public policy. When I joined the CRS eleven years earlier, researchers had time to research proactively. We wrote reports after lengthy periods of study, often while Congress was out of town for summer or winter vacation. By the time I left, however, I was working year round mostly in a frantic, reactive research mode," Kosar wrote. While Kosar did not advocate for or against making reports publicly available, he did state CRS does "incredible work on critical issues." Lance and Quigley requested the House Administration Committee take up the measure, citing taxpayer funding and the benefit publicly available of non-partisan analysis. "By providing public access to CRS reports, we can elevate our national discourse and make it easier for citizens to cut through the misinformation that too often pollutes the national debate," Lance said according to a January 14 press release.